Some people just can't live with the mystery. 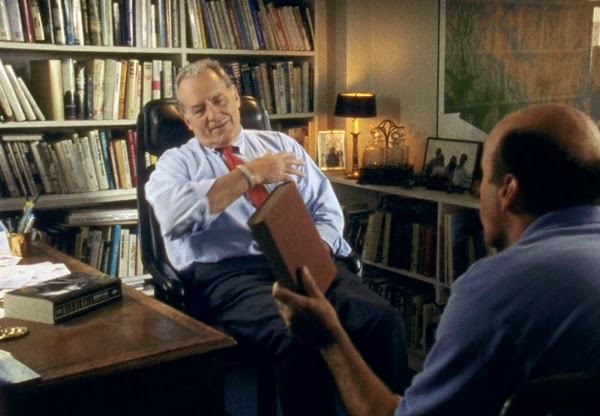 I first saw Mark Moskowitz's amazing and revelatory documentary Stone Reader under ideal conditions: at Roger Ebert's Overlooked Film Festival before its general theatrical release with the director and subject of the film in attendance. 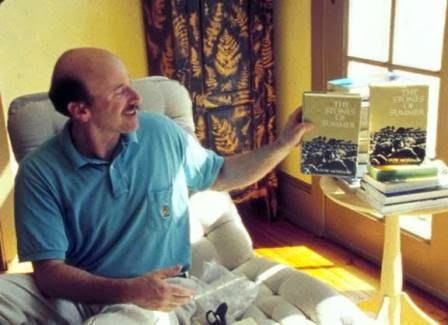 The film details Moskowitz's search to find the elusive author of a book he absolutely loved. Author Dow Mossman seemed to drop off the face of the earth once his book, The Stones of Summer, was published in 1972 to rave reviews but quickly forgotten. Because of this documentary, a new edition of The Stones of Summer is back in print. I love documentaries that accomplish things. The Thin Blue Line proved a death-row inmate's innocence, and he was released from prison. Bowling for Columbine shamed K-Mart stores into halting the sale of handgun ammunition. In Search of Ancient Astronauts provided me with a satisfying nap one fine afternoon. Moskowitz is a reader. To say that his film is a "love letter" to books and reading is a cliche, but it also does not go far enough. Moskowitz's reading habits border on obsession. In one of the disc's special features, he reveals that when he finds a new author that he loves, he will wait until that author publishes a third book before he will read the second because he doesn't want to be disappointed that there isn't one more. Part of his quest to find Mossman was rooted in the disbelief and sadness that, after The Stones of Summer, there wasn't one more. Moskowitz's search for Mossman takes a full two years. He travels to meet most anyone who had anything to do with the book: John Seelye, who wrote a rave review in the New York Times; the man who designed the book jacket, and the man who took the photograph for the book jacket; Mossman's teacher at the Iowa Writer's Workshop, William Cotter Murray, to whom the book is dedicated; Mossman's original literary agent, Carl Brandt; and Mossman's friend Dan Guenther, whose real letters from Vietnam appear in the book as fictions. All of these men have thoughtful and startling things to say about the nature of literature and the nature of authors. I too love to read. It is my third favorite activity. Most of my pleasant childhood memories involve books: reading books, going to the library, receiving books as gifts, and my mother yelling at me to stop reading and go outside and play already. When one is fully involved in reading, the book falls away and the reader is transported to another place, a place that one of the literature professors interviewed in Stone Reader calls "deeply spiritual." TANGENT: Lately I find myself reading less and less. Sure, some of what tears me away from the printed page is this pesky little thing called a full-time job, but still, more often I find myself filling idle time with electronic pursuits, just like a majority of my students, who I frequently upbraid for not reading enough. A movie can play in an empty theater but the action of the movie – the performances, the story, the plot and characters – don’t change because no one is watching. It was produced; it happened, and the film shows how it happened. But where does the “action” of an unread book exist? As many of the talking heads Moskowitz has assembled attest, the reader is essential in the making of meaning. The act of reading makes you smarter and more empathetic. Reading is participatory in a way that even movies can never be. I am not blaming the movies for my recent lack of reading. 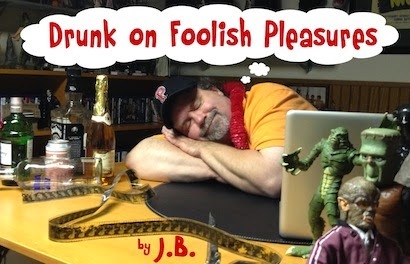 However, I will point out the obvious irony of you, gentle (stone) reader, reading this, my column, which is about a movie, which is about a book, which not a lot of people have read, and which is also about reading. Someone should make a documentary film based on this column and complete the circle. Many reviewers on the Internet really hate Stone Reader, and almost all of them for more or less the same reason: they have no patience for how long it takes Mark Moskowitz to finally find Dow Mossman. They have no patience for the journey and just want to skip to the end. For a reader, “just skip to the end” is anathema; these people are missing the point. Last week I went to see illusionists Penn and Teller. At one point in the show, Penn Jillette has a monologue about how some people just "can't live with the mystery" of their magic tricks and invent all sorts of crazy "solutions." Jillette is actually EATING FIRE as he explains this; earlier in the show, Teller had performed a trick where he seems to swallow a hundred needles and a length of thread, then regurgitates the now-threaded needles. Jillette explains that some people are so uncomfortable with the mystery that, after the show, they shout crazy "solutions" to these illusions: "Candy needles!" "Cold fire!" Ridiculous. These are the same people who scream that Moskowitz should have just used Google (even though, in general, internet search capabilities were far less robust in 2002) or a phone directory to track down Mossman in a single day. These people can't live with the mystery. They have no time for the journey. REAL-LIFE TRIVIAL NOTE: At the Ebertfest that provided my first screening of the film, Dow Mossman appeared live for the Q & A and later met director Werner Herzog backstage. Apparently, that weekend the two discovered that they had many things in common and shared several intense conversations. A friendship was born. Mossman and Herzog continue to write and meet with each other to this day. A follow-up documentary should be planned, titled The Strange and Circuitous Route by which a Hermit Novelist Met and Befriended an Internationally Acclaimed, Eccentric German Filmmaker-- in 3D! Like many of the documentaries I treasure, Stone Reader has a deliberate pace and features a surplus of B-roll material intended by the filmmaker, I have always imagined, to give the film room to breathe and the audience some time in the theater to sort things out and meditate on the subject of the film. The shots of nature (at one point early on, Moskowitz admits to shooting the moon one night because he knows that shots like that will somehow make their way into the film) are our invitation to "read between the lines," to actually create emotional content and connection in our minds, just as readers do when reading favorite books. For me, it works. I feel the long and crazy-tangential road that Moskowitz chooses to take is a metaphor for a book, or perhaps it is simply a representation of the long and crazy-tangential roads that are our lives. 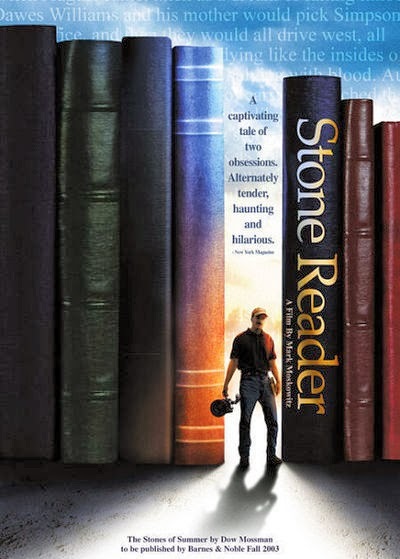 Stone Reader is a film to treasure and I recommend it to my readers who sometimes enjoy the journey more than the destination. After my first screening of Stone Reader, I purchased a paperback copy of Dow Mossman’s The Stones of Summer. I haven’t read it.